Steel & Aluminum Portable Yard & Container Access Ramps and Mobile Dock Bridges at Global Industrial. 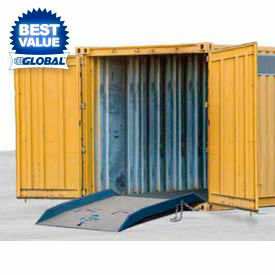 The Perfect Solution for Loading and Unloading Shipping Containers! Bluff® Forklift Container Ramps allow you to safely access product in Shipping or Storage Containers in your yard with a forklift truck. Container Ramps allow safe navigation from the ground to the bed of the Container, and back to ground-level. Ramps feature a full-width stiffener which adds strength against the storage container, and a sturdy grab notch bracket is welded into the sides of the ramp. Container Dock Board features fold-down lifting loops that allow a forklift to transport and position, and include locking safety chains with a specially designed keeper that easily locks into the container. All-welded steel construction for high traffic cycles. ** The HT" DIFFERENCE UP is the height difference above ground-level. Bluff® Steel Forklift Yard Ramps provide easy Forklift or Pallet Truck Access to Freight in Minutes without requiring Dock Bays. Bluff® Steel Forklift Yard Ramps help load and unload trucks and trailers at areas without docks (ground to truck), as well as from the dock level to the ground. All-welded, heavy-duty formed steel cross members and side girders form a superior frame. 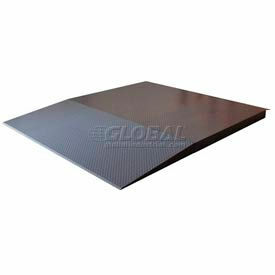 Beveled diamond plate steel approach provides a smooth transition. Open serrated steel grating Ramp surface provides superior traction while reducing dirt, rain and snow build-up. Yard Ramp features double-action hydraulic lift pump and 18" diameter solid rubber wheels to quickly move and raise ramp into position. Safety locking chains secure ramp to dock or trailer. Yard Ramps include 8"H curbs to help keep trucks and forklifts on the Ramp. 36'L Ramps feature a 6'L level-off zone at top of ramp for safe "dock to ground" or "truck to ground" access. Choose Tow Bar style Yard Ramps that offer a fast hook-up for easy towing over long distances, or Ramp Clamp loops that allow forklift tine insertion points for moving over short distances. Other Capacities and Sizes available; Please call for pricing. 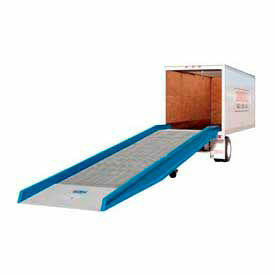 Forklift Ramps help Load and Unload Trucks and Trailers at areas without Docks. Vestil Aluminum Forklift Yard Ramps with Steel Grating provide easy forklift or pallet truck access to freight without requiring docking bays. Ramp offers a 45-62" service height range. Positive steel grating provides superior traction while reducing rain and snow build-up. 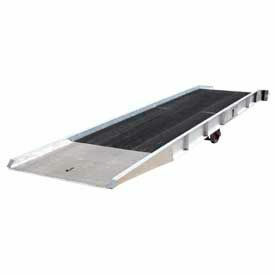 Yard Ramps include safety locking chains and 15" overlapping lip to secure ramp to dock or truck. 4"H safety curb sides help keep trucks and forklifts on ramp. Forklift Ramps include 9" diameter steel wheels and a manual two-speed hand crank lift. 36'L Ramps feature a 6'L level-off at top of ramp for safe dock-to-ground or truck-to-ground access. Bluff® Mini Yard Ramps offer an Economical Solution for Applications where the High Side is 33" or Less! There are a world of applications that have a target height that is one-half or less of a typical dock height, and this "Little Brother to a Yard Ramp" is the answer. These Mini-Ramps will service heights from 12" to 33", allowing greater flexibility than conventional Yard Ramps. Solid steel diamond deck floor plate approaches on both the top and the bottom ensure long life whether using manual equipment or forklift trucks. Ramp features a serrated steel grating surface that provides superior traction while reducing dirt, rain and snow build-up. Safety locking chains secure Ramp to dock or trailer, and 6"H safety curbs help keep forklifts and equipment on the Ramp. Other Capacities and Sizes available; Please call for pricing. Load and Unload Shipping Containers Quickly and Easily. Vestil Steel Container Ramps are designed to facilitate the loading and unloading of overseas Shipping Containers at ground level. Container Ramps feature a hinged lip that folds up to reveal fork pockets that allow easy portability with a forklift truck. Tapered entrance lip provides a smooth transition into Containers of various heights. Rugged welded steel construction with a durable, earth-tone enamel finish. Overall height of ramp is 4-3/8". 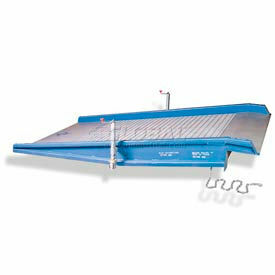 Vestil Aluminum Yard Ramp SY-208436-L with Steel Grating 36'L 20,000 Lb. Cap.